(14/04/2019 18:26)motormayhem1 Wrote: Stagecoach could purchase a few depots on merseyside so long as they dont operate over a certain percentage of the Market. North Wales could be a good venture for them too as well as runcorn. I think that would be bootle they would get rid of if any. Business wise Wythenshawe is toast- the only way another firm would entertain it is if they wanted a ready made depot to gamble on Andy Burnham's franchise plans. I feel Arriva have (had) plans to grow the profitability of Runcorn, trams and bridges have seriously affected their businesses. DB have visions of selling as the whole (as Angela has ordered), but in reality Stagecoach will cherry pick, but personally, I feel, Go Ahead, Transdev and Rotala will fight for the remnants. Please DO NOT take the above as read- they are only my own views based on today's news although I've had a heads up on part. Seems like Merseyside is keeping to form in the industry! (14/04/2019 22:36)motormayhem1 Wrote: I think that would be bootle they would get rid of if any. Suspect also that DB will keep some share capital so will really just be that other people or organisations can hold a shareholding, the only stage sales would be made would be if either, Arriva PLC made heavy loses and the bank advised them to make sales and brought in its own staff as at FirstGroup or they sold a depot or depots to meet an option in order to buy another fleet adjoining, say if National Express Group was bought for example by Arriva PLC then say adjoining depots of Arriva Midlands might be for sale. Or the only other way might be if Franchising was introduced into PTE area's and places like Bristol, and it wasn't something Arriva wanted to be involved in then they might quickly retreat from those depot(s), however as they already operate franchised work happily for TfL I can't see this being the case so long as they had a major presence on it, so for example if Franchising was introduced ever in Merseyside, Tyne & Wear or West Yorkshire as they are major players there it wouldn't bother them, however Greater Manchester as a minor player might be a different kettle of fish. I've looked at this again, I really can't see how Stagecoach would be able to acquire it, without making a bid for the whole business pre-flotation or after flotation as its not being broken up and sold in that way. Straight away there would be issues for Stagecoach with the MMC/OFT and the Rail Regulator, these are. 1. North East Area Buses around Newcastle and specifically the Newcastle depot of Arriva. 2. The ajoining territory between Arriva Yorkshire and Stagecoach Yorkshire. 7. Operations were Stagecoach East Kent and Arriva Kent & Sussex join eg around Ashford, Maidstone, Hawkhurst, Hastings and Tenterden. 8. 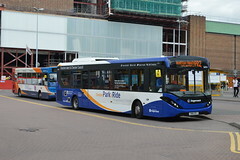 The rail franchises owned by Arriva would not be allowed to be operated by Stagecoach as they are barred from operating Rail Franchises due to pensions issues. So with all this removed there's very little the MMC could actually clear them to own if it was a one opp sale and most would have to be sold separately, the only operations they would have no issue with owning would be the European bus and train operations, plus the Tyne & Wear Metro. There is nothing wrong with overlapping ops. It's just a case of having competition in the areas. Stagecoach would have to sell parts off. London would probably be a case of hand back all the contracts and everyone re-bids for them so then Stagecoach won't have the market share, the routes can be given to other operators. Manchester I can't see being as much of an issue with Wythenshawe not being huge, there isn't many routes. Diamond, MCT, GoGoodwins & D&G run in the area (with First and GoAhead (soon) operating at the Trafford Centre), there is a lot of competition. Bolton has Vision, Tyrers, Diamond and First in the area so again, a lot of competition so it might go through a bit easier. Chorley area would be fine as Transdev run the 24 and Preston Bus in the area. I can't comment on the other areas but the main thing with the CMA is companies having a too much of a stronghold on areas. If a few other (reasonably sized) operators do run services, it won't be as big of an issue as Stagecoach won't be the only operator.